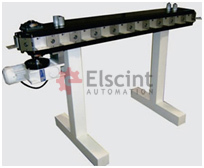 Elscint represents Italplant indexing systems in India. 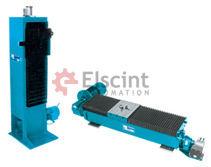 The entire range of Italplant Indexing Systems is available in India through Elscint. You can also download 2D and 3D drawings of the complete Italplant range of Indexing Systems. Globocylindrical Cam A very robust and proven standard Indexing with orthogonal axes, compact design and large dial plate. Available from 2 to 32 stops. Globoidal Cam HIGH SPEED-1000RPM Indexing units with orthogonal axes, high accuracy, no backlash. Twin dwell cams and various other cam laws. Available from 1 to 48 stops. Most of these mechanisms can be supplied with the high speed twin dwell globoidal cams. Moreover, all of these limiter (SOTL) and adjustable transmission torque (ATT). (PDF) can be supplied as Oscillators. 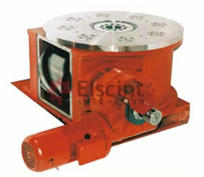 Plastic Indexer Extremely light; Suitable for corrosive and explosive enviornment. Parallel shaft indexers/oscillators Suited for parallel shafts machinery, from 1 to 8 stops, and from 15 to 45 swing angle. Heavy duty indexers Indexing units with orthogonal axis for large welding plans and big fixtures, up to 16 metres diameter. Dinamic capacities up to 16.000 Nm. Precision of positioning ± 0,06 mm. It is possibile special versions with high load capacity, also with double link of pallets. Transfer Systems / Lifts Systems for loads up to 3.000 kg. and accelerations up to 3 gansfer Systems / Lifts Lifts size: ML8, ML10, ML15, ML25, ML30 Transfer system size: MT8, MT10, MT15, MT25 It is possible to have special versions with bigger strokes and chariots. All Italplant Indexers are compatible with other brands of index units and can be supplied with a dial plate mounted and machined to customer’s exact specifications. 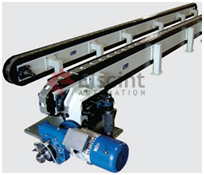 Where the project requires an inline system Italplant specialise in Precision Link conveyors for high accuracy stations such as laser marking, pad printing and vision inspection applications. Size and number of indexes can be specified to suit each application vertical lifts with high pay loads and cam high speed rotary pick & place arms can all be supplied.